Tucked away up a quiet street behind the bustling harbour of Gaios, Eleni is a spacious and attractively furnished three-bedroom apartment in a very convenient location. 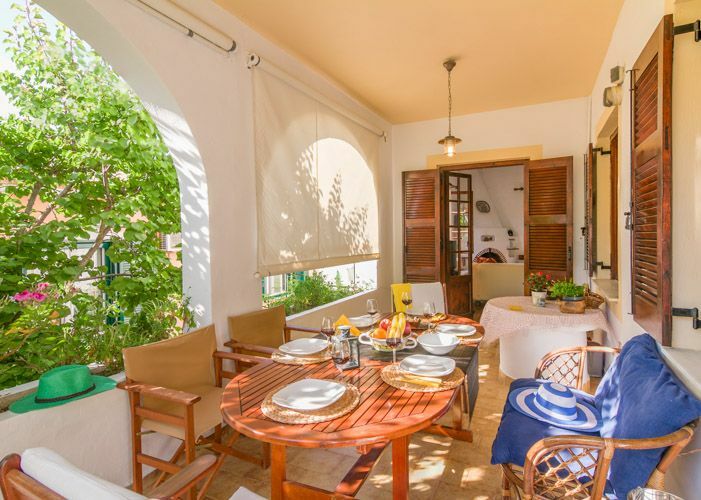 Situated on the ground floor of a two-storey house - the upper storey being the holiday home of the friendly owner, Eleni - the apartment is well-equipped and has an attractive private terrace to the side, festooned with flowers. A patio to the side of the apartment provides an ideal spot for afternoon drinks in the shade of the sun umbrella. Three minutes' walk away from the tavernas and the shops of Gaios, and five minutes from the town beach, Eleni's house offers a sought-after combination of seclusion and easy access. The property is also conveniently located for the boats travelling over to the wonderful sandy beaches on Anti-Paxos. 3 bedrooms (2 double, 1 twin), large sitting/dining room with fireplace, breakfast bar, kitchen, bathroom (with bath), shower room, balcony, patio. La casa è molto accogliente. La proprietaria disponibile. La casa è in una ottima posizione. Tranquillo ed appartato ma vicina al centro del paese. Per 6 persone ma ideale solo per due coppie. I bagni sarebbero da ristrutturare. Accessoriata di tutto.... mancano solo le zanzariere!!!! E di zanzare ce ne sono tante.